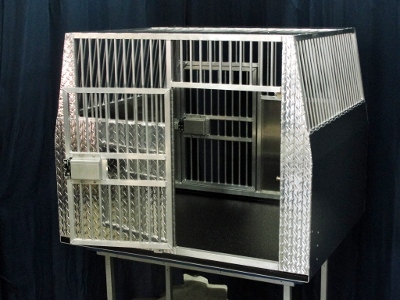 What a great way to get more ventilation and light into your crate. Our roof vents are window panels welded into the top of the crate. Many new cars have A/C vents in the roof of the cargo area. Great way to send some cool air directly to your dog. Sprayed Insides - start @ $295.00 ea. 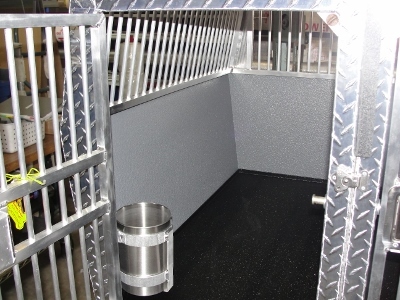 Have the inside walls of your crate sprayed with bed liner. 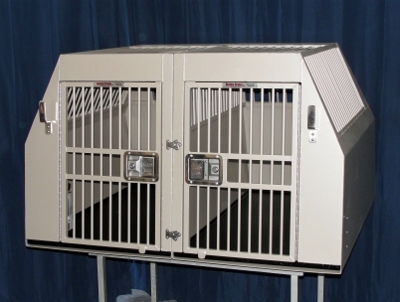 If you have a light colored dog that's super active in the crate, this is a great option. Crates come standard with the metal pan in the bottom that is sprayed black. Have your leash ready every time. Our leash hooks are stylish and sturdy. 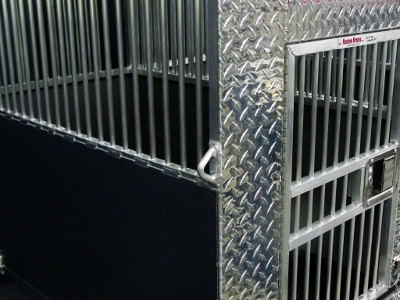 Whether it's for safety or convenience, adding another door to your crate is a great option. Lots of people worry about getting hit from the rear and being unable to get their dogs out. 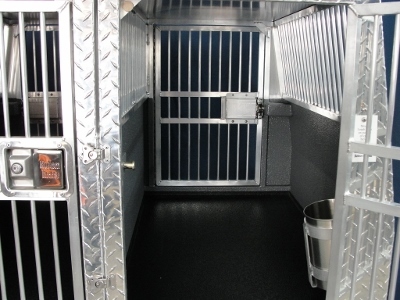 This can also make a single crate very versatile with an end and side door option. Side door option - start @$590.00. Angled Front or Back - $395.00ea. Sometimes keeping the back seats up requires some very custom stuff to make sure the dog fits. We use the latest scanner technology to allow us to build a crate setup that fits like a glove. 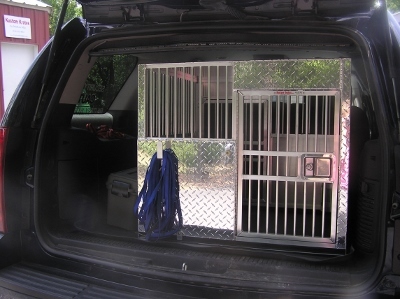 SUV's have cargo areas with many different shapes. We can build a crate setup to fit yours. Most SUV's have very curvy hatch openings. Angled sides allow you to have ample floor space for your dog. This picture also shows ventilation above the window on an extra tall crate. Plus it has a rear door for safety. We call it maximum ventilation. 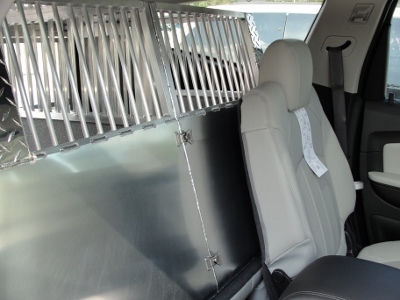 Since safety is the utmost concern for you, we design a crate with enough reinforced framework to provide the structural integrity required to take a crash. Double windows can be added to one, or all four sides of a crate. Match your crate to your car. 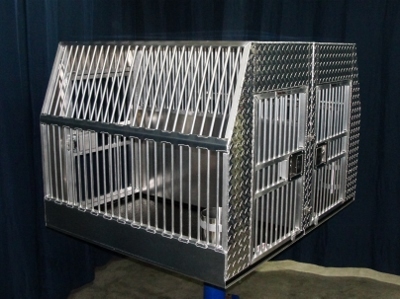 We can powder coat your crate setup to match just about any color. This is the ultimate in style. If you have a dog, you have gear. We know that because we are dog people. 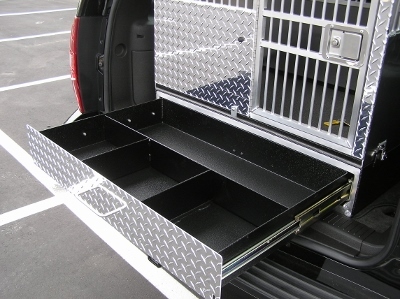 Our equipment boxes are double wall for maximum strength and we use super heavy duty drawer slides. Load it down, we don't care. Drawers can be set up to use a padlock or our rotary style key lock. Upper Storage - start @ $450.00ea. This is a great idea for carrying all kinds of stuff. Makes for easy access as you can see everything. Upper storage is a great idea with or without an equipment box. Want to tie it down. We have the answer. We weld these on so that they can't come loose. I hate things that rattle. 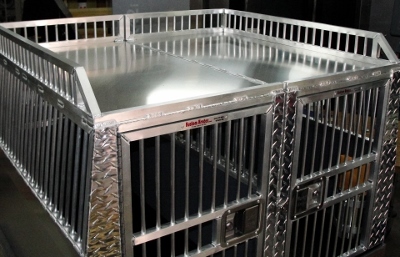 These can be added to single crates and multi dog setups.